Display your travel-inspired wedding theme with this beautiful shadow box wishing well. 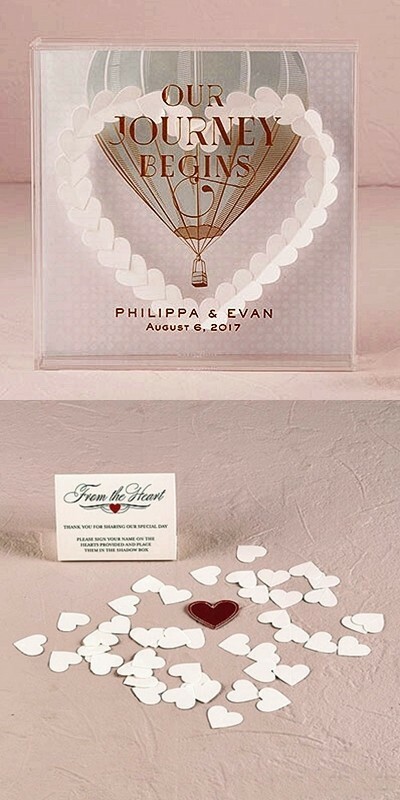 The included die-cut hearts (180 white and 1 red with stitched edging) and instructions tent card will prompt your guests to sign their names and/or well wishes and place them into the wishing well. Following the wedding, you may want to do a DIY arrangement of the hearts into a motif that appeals to you (such as your new last name initial or a romantic heart shape). Includes a whimsical vintage-look hot air balloon background card printed with the sentiment "OUR JOURNEY BEGINS". The box may be etched with the happy couple's names and wedding date or two lines of custom text in the pictured gold fill.